It goes without saying, when a couple falls in love, set their wedding date and location - there is nothing that will stop them for going through with their plans. 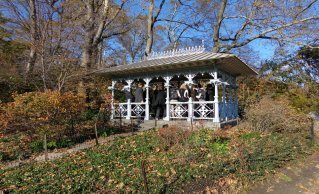 In November, I witnessed three weddings in New York City in Central Park under a well-known location, the ‘Ladies Pavilion’. There is nothing unusual about the three weddings except it was outdoors, patches of snow was on the ground and the temperature was between 32 to 35 degrees but a beautiful sunny day. Oh, by the way, it was a week after hurricane Sandy. Each couple had one hour to celebrate their wedding. There were photographers, videographers, violins a minister and about 10 to 30 guests per couple. Each bride made their grand entrance down the park’s long walkway while waiting under the pavilion was a very happy groom. The first bride wore a three quarter-length sleeve, ivory taffeta sheath style gown, with a matching shawl. The second bride wore white cap sleeves and lace over a satin mermaid style gown and the third bride wore a white strapless, charmeuse A-line style gown. After each bride and groom stated their “I DOs" close by the pavilion, a small meet n greet celebration was held near a beautiful lake where the couples and their guests enjoyed hot chocolate and cookies. An extraordinary day for a personalized wedding. During my Thanksgiving vacation I traveled to Bloomington, MN and on one of the busiest shopping days of the year, I meet a loving couple that got married on "Black Friday" in the largest shopping locations in America - the 'Mall of America' at the Chapel of Love. June 21, 2012. However, love would not let them wait. Kimberly and Melvin stated; while June 21 remains for what is now called their “One Love” Celebration; they chose to unite their love before God, their children and two of their best friends on November 23, 2012, also known as “Black Friday. The couple chose the ‘Chapel of Love’, for their wedding venue because of the intimate environment, charming décor and most of all, package pricing. The Chapel is private, warm and inviting. The low lights set the mood and atmosphere for love. There was dramatic winding greenery and tropical flowers swirling around two white colonial style pillars and an arch that set the stage for the alter. Also a beautiful five foot, free standing, three-arm gold candelabra held the long tapered unity candles. While the couple’s guests seat in rows of white pews, soft melodies of love announce the couple’s grand entrance. The officiant stood waiting patiently with a welcome smile as the couple walked toward their destiny together. The bride wore a beautiful white one-strap, sheer organza, A-line style gown and the groom wore a three piece pinstriped brown suit. After the ceremony the couple shared best wishes and photos with their guests. The Chapel of Love is a wedding chapel and bridal boutique where they offer a truly customized celebration in a beautiful garden chapel that will seat up to 70 guests, for a dream wedding or vow renewal. The Chapel of Love will offer you a selection of wedding gowns, tuxedos, bouquets, custom music, Officiant, unity candles, garters, toasting glasses and a bottle of champagne. There is also a photographer and videographer package selection. What a joy it was to see how these couples celebrated their wedding. Another reminder that: Love has a Style of its own!